Democratic Revolutionary Youth Front (DRYF) the youth wing of CPRM and CPRM party today posters pasted all over the Kalimpong raising some important points relating to development in Darjeeling hills.The posters demand the following' We do not need GTA, DGHC or 6th Schedule status - but Gorkhaland statehood. Darjeeling region needs to be re-aligned administratively, turning the current 8 Blocks and 112 Gram Panchayats into 24 Blocks and 160 Gram Panchayats for better administrative reach.Form Darjeeling, Kalimpong, Kurseong and Mirik as sub-divisions and conduct 3-tier panchayat elections on the lines of Siliguri Mahakuma Parishad elections.The poster demands that the Land rights should be given to tea garden workers, forest villagers, cinchona plantation workers, people living near national highway 31 A and seed farms.Lands currently under to DI Fund and Development Area need to be brought under the department of Land reforms.Tea garden workers must be brought under the ambit of Minimum Wages Act.The 5 tea gardens under WBTDCL should not be handed over to private companies.Fill up all the government positions and posts currently lying vacant in the hills, immediately.Investigate the ghotala relating to 100 days work, and arrest those who have been fleecing public of their rights.Arrest all those brokers who fleeced people in Cheat-Fund cases. Stop unnecessary and fake foundation stone lying ceremony, instead focus on developing industries that can generate employment for the youth in the region.It have aslo target CM Banerjee Statement given at Gorubathan of waiving electric bill and have asked that it is ' False Ghosna'? One poster read ' Didi ko Switzerland ma janta le piune pani na pai tirkai marnu parne" In Didi Switzerland people have been left to die thirsty.The DRYF along with Kalimpong pasted poster at Munsong , Kashyem under Cinchona plantation. 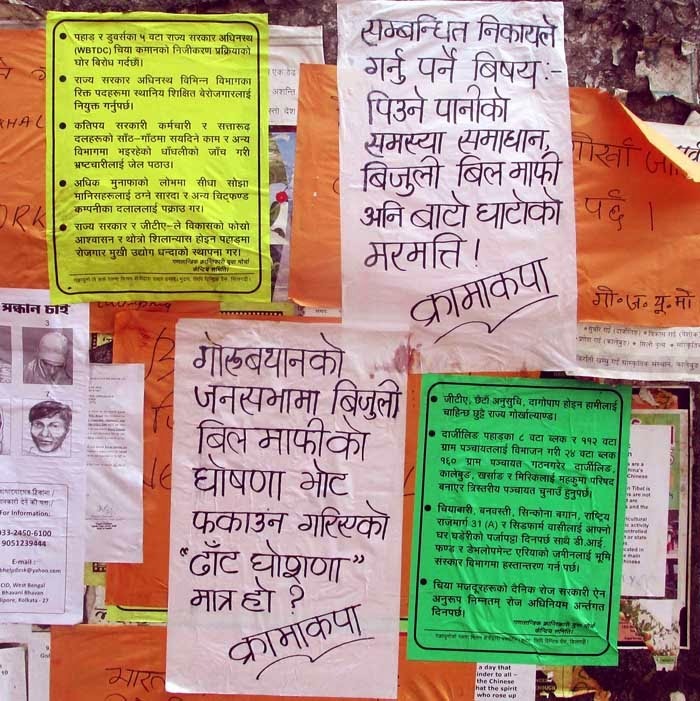 Democratic Revolutionary Youth Front (DRYF) the youth wing of CPRM and CPRM party today posters pasted all over the Kalimpong raising some important points relating to development in Darjeeling hills.